We, as computer users, run applications -- all sorts of them. We browse the web with an program, send e-mail via another, write up reports, crunch numbers, listen to music, transfer files and store contacts using a long list of different applications. There are thousands upon thousands of programs floating around the digital world and there's one problem: they don't all run on your operating system. Almost all of us, at one time or another, will come to a point where we have an operating system and matching programs that do almost everything we want and, on the other hand, a program which doesn't run natively on our OS of choice. Fortunately there are ways of dealing with this. Some people dual-boot their systems and deal with the awkward transition between platforms. Others use virtual machines and work with the overhead involved with running two systems at the same time. A third option is to build compatibility into one OS so that it can run programs designed for a different OS and that's where Bordeaux comes in. The Bordeaux Technology Group is a company specializing in compatibility software. Specifically, they work at making it as easy as possible to run Windows programs on the UNIX family of operating systems. Their Bordeaux tool is built to run on Linux, FreeBSD, Solaris, OpenIndiana and Mac OS X. Bordeaux is, at its heart, a customized build of Wine. They take a recent version of Wine, add some special tools and test their build for compatibility against a group of popular Windows software. They then sell this bundle (along with support) for about US$20 - 25, much less than the typical cost of a Windows license. A few weeks ago I had a chance to chat with Tom, a member of the Bordeaux Technology Group, and he was kind enough to give me a copy of Bordeaux (PC-BSD edition) to test-drive. The provided PBI package was about 44 MB and it installed without any problems. With the install completed, two icons were added to my desktop and application menu. These new icons were labelled "Bordeaux" and "Cellar Manager". I launched Bordeaux first and was presented with a new window featuring three tabs along the top. These three tabs are called "Install Applications", "Manage Wine" and "Unsupported Packages". At the bottom of the window, regardless of which tab is selected, are two buttons called "Help" and "Install". Clicking the Help button always opens a browser window to the Bordeaux documentation website. The Install button actually performs different functions depending on which tab is selected. Let's start with the Manage Wine tab. It provides us with a list of basic Windows software, such as Notepad, Minesweeper and the Registry Editor. Clicking on one of these items and clicking the Install button launches the program. It's pretty straightforward and I didn't have any problem using these built-in items. The Install Applications tab is a bit more interesting. This tab provides us with a list of Windows software which is supported by Bordeaux. Highlighting one of the items and clicking the Install button will perform one of two actions. 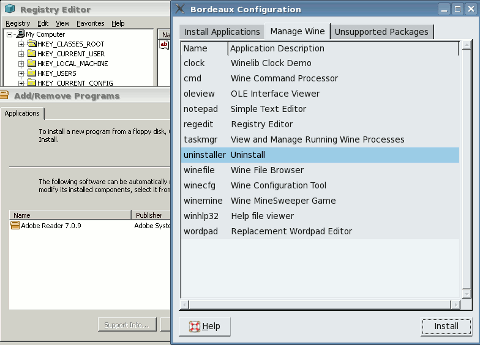 In cases where the highlighted software is freely available online, Bordeaux will download and install the application. I tried this with Internet Explorer 7, Safari, QuickTime Player and Google's SketchUp. Each of them downloaded and installed without and problems and the first three ran smoothly. The SketchUp program installed on my machine, but I ran into problems running it and experienced frequent crashes. I haven't used SketchUp before, so I'm uncertain as to how much of this is a problem with the application itself, with Bordeaux, or with my hardware. There are several other programs available in the support list, many of them Microsoft Office products. Picking one of these options and clicking the Install button would kick off work in the background and install some components. Bordeaux didn't provide much information as to what was going on, but I suspect it was configuring my environment to work with the highlighted software.